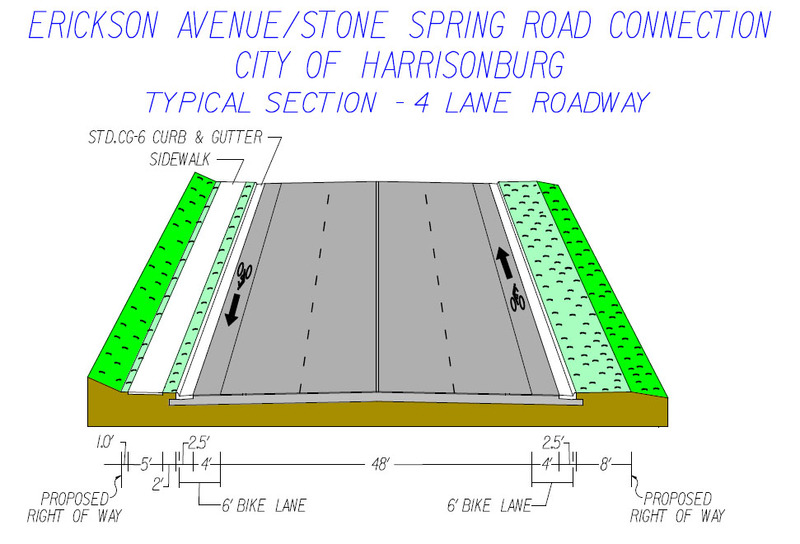 The Erickson Avenue/Stone Spring Road Project improves street system connectivity, provides better east to west mobility, and addresses deficient capacity and critical safety concerns in the southern portion of the City of Harrisonburg. Initial conceptual planning for this project began in the late 1980s. In the mid 1990s, the City entered into contract with Mattern & Craig, Inc. to perform design and engineering services. The Erickson Avenue/Stone Spring Road Connection spans 3.1-miles stretching from west city limits to east city limits, providing the only continuous transportation link other than Route 33. This route provides an alternative for traffic that previously winded through residential areas. The project is divided into four phases. Funds for the construction project are from a combination of Local Funds, plus State and Federal Urban Transportation Funds. Planning began. City hired consultant engineering firm Mattern & Craig, Inc.
Design work began and environmental reviews continued. Phase I construction by Perry Engineering Company, Inc. Phase II construction by Perry Engineering Company, Inc. Phase III construction by Perry Engineering Company, Inc. Contractor: Perry Engineering Company, Inc. Phase I for corridor improvement is a 0.23-mile section of Erickson Avenue at the intersection of South High Street (Route 42). Although relatively short in length, the project addressed extremely critical traffic capacity and safety issues. The project widened Erickson Avenue, approximately 600 feet west of the intersection, from 2-lane, 22-feet wide, asphalt surface and ditch street section to 5-lanes with curb and gutter, a minimum of 48 feet wide asphalt surface to provide adequate turn lanes. On-street, 4 foot wide bicycle lanes in each direction and a sidewalk are provided for the project. The intersection with Route 42 was widened and improved to add right turn lanes. 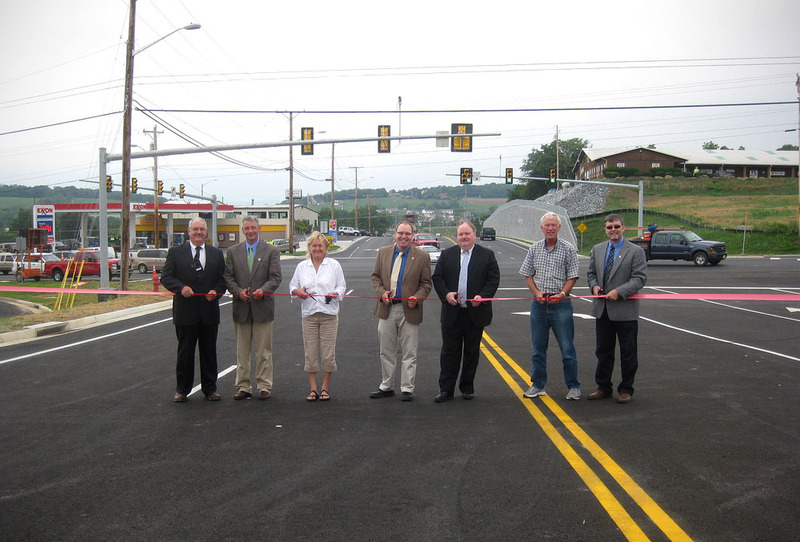 In addition to relocation of the railroad and removal of the existing trestle, existing Pear Street was relocated approximately 450 feet east of Route 42 to a new intersection with improved Erickson Avenue. Pear Street was also improved to a 30-feet wide street with curb and gutter to meet current horizontal and vertical standards. Ribbon cutting ceremony for Phase I, August 2010. From left to right: Director of Public Works James Baker, Councilmember Ted Byrd, Councilmember Carolyn Frank, Mayor Kai Degner, Councilmember Richard Baugh, Councilmember David Wiens, and City Manager Kurt Hodgen. 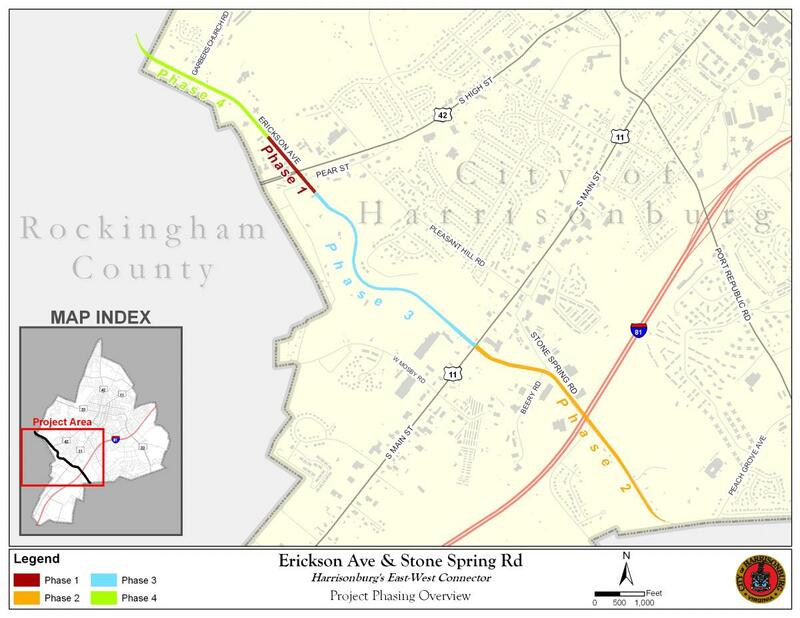 Phase II of the project involved improving existing Stone Spring Road between S. Main Street (Rt 11) to east city limits (near Peach Grove Ave). A 5-lane roadway with center turn lane, bicycle lanes, and sidewalks were constructed. Additionally, Ramblewood Road was realigned, moving away from the Interstate 81 bridge. Improvements also included widening of the bridge over I-81 to 5-lanes. Ribbon cutting ceremony for Phase II, November 2012. From left to right: City Manager Kurt Hodgen, Councilmember Ted Byrd, Councilmember Dave Wiens, Councilmember Charlie Chenault, Mayor Richard Baugh, and Assistant City Manager Anne Lewis. Contractor Perry Engineering Company, Inc. 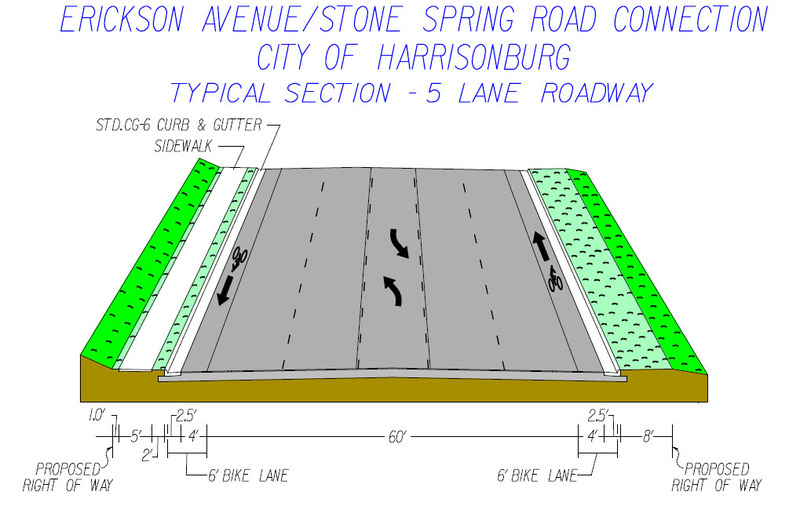 Phase III of the project connects Erickson Avenue at Pear Street with Stone Spring Road at S Main Street (Route 11) on new alignment. Bicycle and pedestrian facilities were provided. This section has controlled access. 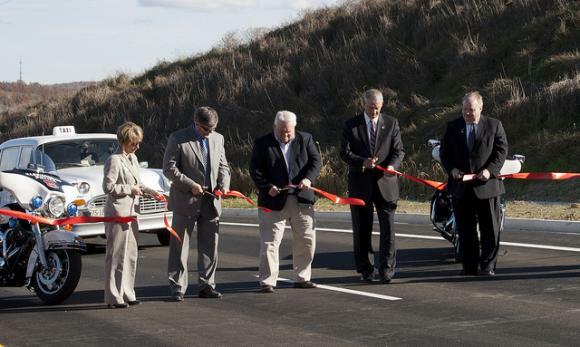 Ribbon cutting ceremony for Phase III, November 2013. From left to right: Assistant City Manager Anne Lewis, City Manager Kurt Hodgen, Councilmember Charlie Chenault, Mayor Ted Byrd, and Councilmember Richard Baugh. 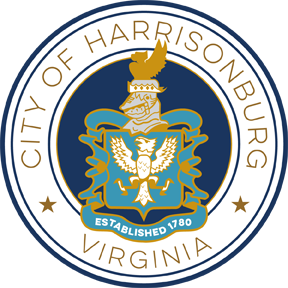 Phase IV of the project involves improvements to existing Erickson Avenue from S High Street (Rt 42) and west city limits. The project entails widening Erickson Avenue to a 5-lane roadway with center turn lane, bicycle lanes, and sidewalk. This has not been constructed. A 30-inch raw waterline installation will also be coordinated with the road construction project. The new waterline will assist in developing the new eastern waterline supply from the Shenandoah River. Questions? 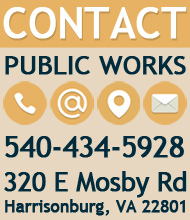 Contact Thomas Hartman, PE, Assistant Director of Public Works at Tom.Hartman@HarrisonburgVA.gov or 540-434-5928.